- BIO Current Projects & Great Western Events Come on out & join us at these great events! Spring 2011 Walk of Western Stars Santa Clarita, CA Santa Clarita Cowboy Festival &Buckaroo Bookshop Palm Springs WestFest March 23-27, 2011 Conejo Valley Days & the 'Relay for Life' benfefiting The American Cancer Society First weekend in October Rex Allen Days benefiting the Rex Allen Museum Come on out & join usfor a great time! Come on out & join us at these great events! Julie came by her love of the West naturally. Born into a family rich with Western entertainers, she understood early on how very hard they worked their craft & how very happy their work made others. That's why she happily spends her time these days bringing that happiness to others. She produces live events; most benefiting charities all around U.S. and likes the Western ones the best! 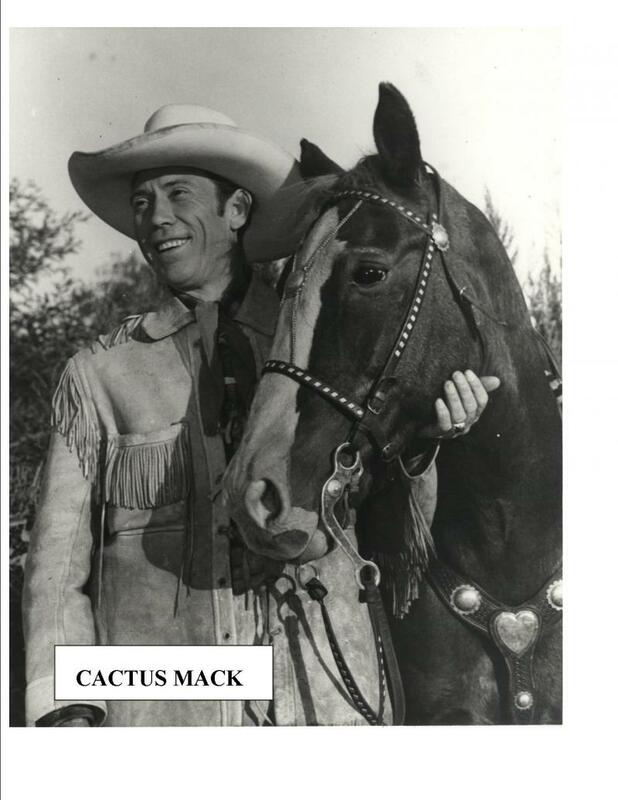 Her Grandfather Taylor 'Cactus Mack' McPeters,was a cowboy, stuntman, musician and actor; a side-kick for both Roy Rogers & Gene Autry and appeared in well over 300 films and television shows. Including most of John Waynes B westerns. A gifted bandleader, heading up Cactus Mack & his Saddle Tramps ,The Arizona Wranglers and O Bar O Cowboys (just to name a few); Cactus befriended a young Leonard Sly, who traveled with him and the O Bar O 'boys before becoming Roy Rogers and the Sons of the Pioneers, respectively. Rex Allen Sr. spoke in his autobiography of the pleasure it was in those early days hearing Cactus & Roy picking & singing in front of the movie theatre in Willcox Arizona. Relatives Glenn Strange and Rex Allen also had quite far reaching careers. Glenn was a cowboy, stuntman & a musician before becoming an actor. More often a 'bad guy', though a sweeter man was never born. 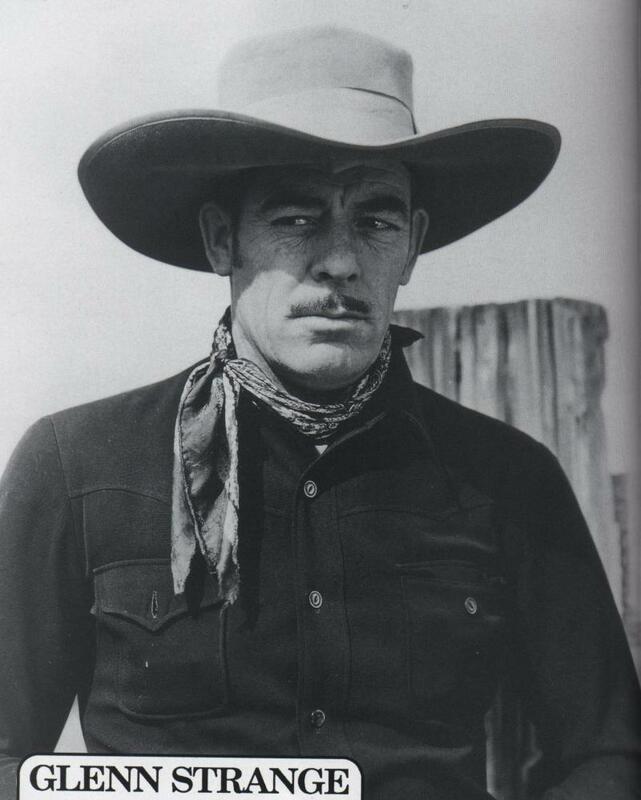 Among his many other roles, he played 'Butch Cavendish' the Lone Rangers nemesis, and ended his career as 'Sam' the bartender in Gunsmoke. He also played the Frankenstein Monster in many of the old Sci-Fi films. Including Abbott & Costello Meet Frankenstein. Cactus & Glenn were lured out to Hollywood in 1929 when working with Hoot Gibson and his Rodeo in Saugus, CA; the ranch grounds now home to the Saugus Speedway. Their true western features, Cherokee Indian decent, and beautiful voices led to quite colorful careers. Rex Allen, the 'Arizona Cowboy' had a voice that is still treasured in the narrations he did of Walt Disney's "Wonderful World of Color" nature shows and behind 150 different cartoon characters created for Walt Disney. 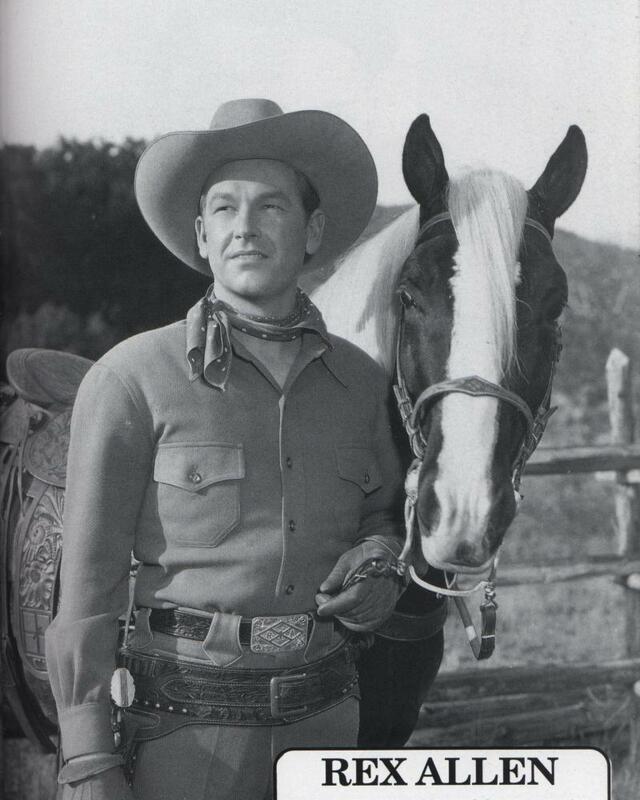 In addition to his many movie & television shows and appearances: he also starred in the television Western Frontier Doctor. Julie writes for various magazines and publications, has been a regular contributor to the Mark Isler Show on KABC TalkRadio 790, and worked as an Investigative Agent for the television show 'Unsolved Mysteries' before finding her way back to her Western roots. 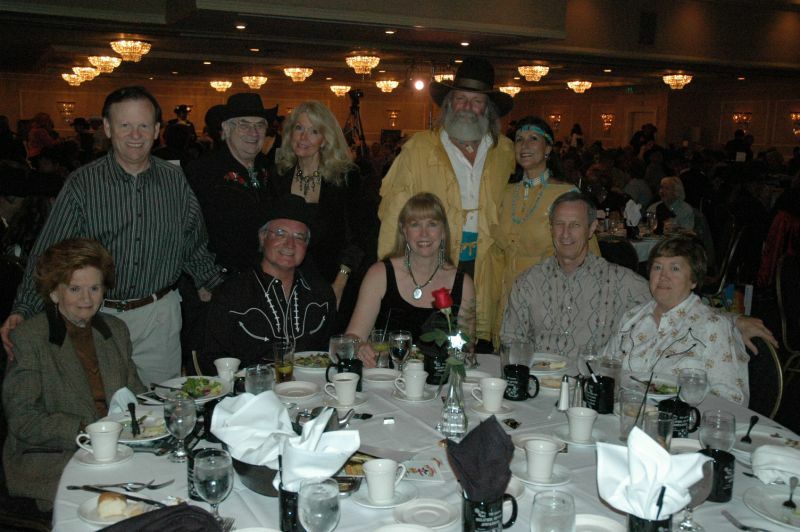 which in 2010 honored her grandfather, Cactus Mack, and in 2013 honored Clint Walker and Angie Dickinson. In addition to the aforementioned projects and her personal appearances, Julie has worked with the city of Santa Clarita in the production of their Walk of Western Stars, and various other projects. 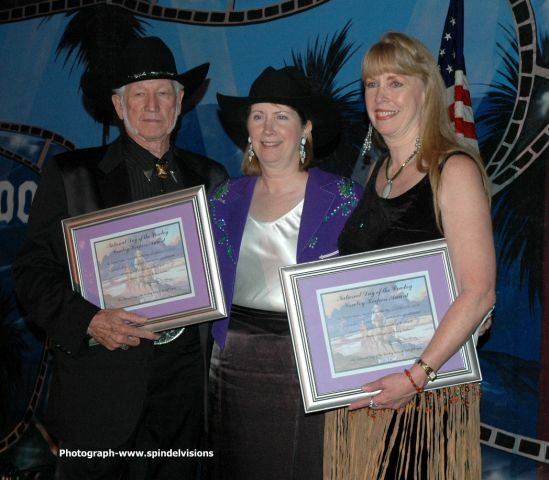 She is Awards coordinator for both the Melody Ranch Museum Dedication and ﻿Southern California Motion Picture Council. She wrote for the book 'Weird Hollywood', and for the bio on 'Gunsmoke's" Miss Kitty, Amanda Blake. Perfectly Amanda; to Dodge City and Beyond. She especially enjoyed writing the introduction. She has contributed to several more books available through her website. They were unveiled in October 2009 when she guested at their 20th Anniversary shows. for her works in 'preserving America's Western Heritage and Cowboy Culture. She can often be seen making guest appearances on behalf of her family to greet their fans, and acts as panel moderator at many festivals around the US. 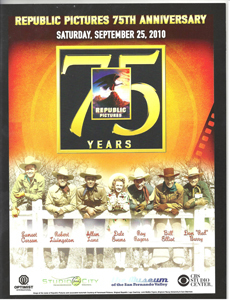 The 75th Anniversary of Republic Pictures. Julie is currently working with San Fernando Valley Relics Museum, which now houses a display on her famous family, and she is co producing the 10th Annual National Day of the Cowboy Event with the museums owner and curator, Tommy Gelinas. click the link below see where she is next appearing. Taylor 'Cactus Mack' McPeters with his horse Tony Jr.
Julie proudly accepted the 'Cowboy Keeper' Award which was presented her by Bethany Braley of the National Day of the Cowboy for her works in "preserving Americas Western Heritage and Cowboy Culture."